The 18,000-square-foot Espa at Vdara and Salon Vdara occupies two levels; the first floor houses 11 treatment rooms, including two couple’s suites, along with relaxation lounges and a meditation room, while the second floor plays host to the boutique, salon and smoothie bar. A 2,000-square-foot fitness center features Cybex cardio and circuit weight training equipment, as well as personal training capabilities. Vdara is part of MGM Resorts International. Espa at Vdara includes a thoughtfully orchestrated collection of massages, body treatments and skincare services that focus on the healing power of nature and utilize high-grade, natural, organic ingredients. These personalized, holistic spa services are designed to take guests to a new state of calm and rejuvenation. The Salon at Vdara boasts services for men and women including professional hair design, luxurious spa manicures and pedicures as well as make-up artistry; all are offered in a unique sanctuary where guests can feel relaxed and pampered. Relaxation and entertainment go hand in hand at the luxury Vdara. Cabanas, chaise loungers, daybeds and plunge pools surround the spacious rooftop pool deck, a stylish lounge area perfect for sunbathing, sipping cocktails or soaking in skyline views. Prime shopping and gaming fun is just steps away at the Crystals retail avenue and at ARIA Resort’s 150,000-square-foot casino, which, along with Vdara, are housed within the CityCenter complex. Never-ending evenings can be enjoyed at Aria’s intoxicating nightclubs or at its Zarkana™ by Cirque du Soleil® performance. Vdara’s Hotel & Spa Bell Desk is available to help guests arrange a wide variety of exciting excursions all within an hour’s drive. Thrill seekers can test their limits with ATV, buggy, horseback and kayak jaunts through Eldorado Canyon and Valley of Fire, while outdoor lovers will connect with nature via Bryce Canyon, Death Valley and Zion National Park explorations. A stay in Las Vegas also provides an excellent starting point for visits to Red Rock Canyon and the Grand Canyon. 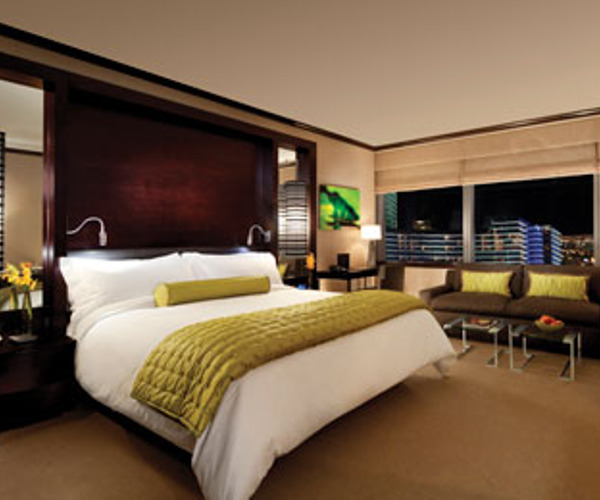 Vdara suites are filled with luxury conveniences to make every stay a comfortable one. The contemporary design seamlessly blends with sophisticated touches, including high-tech accessories and spa-style soaking tubs, and every room features a gourmet kitchen and views of the mountain landscape, CityCenter or Las Vegas Strip. Accommodations range from Deluxe Suites (582 square feet) to the two-bedroom dual-level Penthouse Suites (1,447 square feet) to the Hospitality Suites (1,600 square feet). Bar Vdara and its whimsical design and innovative cuisine appeals to epicureans, as does Market Café Vdara, which features classic American dishes with a European twist, sweet treats, gourmet groceries and a variety of healthy snacks. An alluring centerpiece in the hotel lobby, Bar Vdara dazzles with artsy sculptural screens and an alfresco lounge featuring playful swings and a curved reflection pool. Twenty four-hour in-suite dining is available.